During a ceremony at the Catholic Academy of Bavaria on October 11, 2011, Bishop Gerhard Ludwig Müller, later chosen by Benedict XVI to be Prefect of the Congregation for the Doctrine of the Faith, presented an ecumenical award to Lutheran bishop Johannes Friedrich. In the speech Müller delivered on that occasion, he affirmed that the base upon which relations between Catholics and heretics are established is no longer doctrine or the concept of Church, but rather the baptism that is common to both true and false religions. 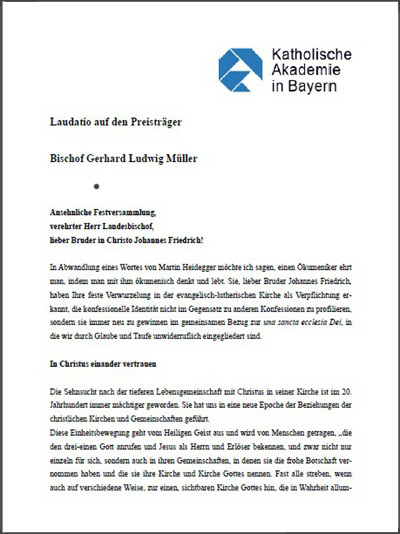 Below we present to our readers a photocopy of the first page of the 9-page-text of Müller's speech in German published by the Catholic Academy of Bavaria, and then the two more important excerpts from his speech. After the photocopies of these excerpts are our translations to English in blue. The full original document can be found here.